Linda Marlowe and Patrick Walshe McBride are today announced as the new stars of the black comedy romantic drama Harold and Maude. Their first performance is Monday April 2 as the acclaimed production extends its run at Charing Cross Theatre by six weeks to Saturday May 12. They will take over from Sheila Hancock and Bill Milner, who will play their final perfomances as scheduled on Saturday March 31. All the rest of original cast are staying for the extended season. 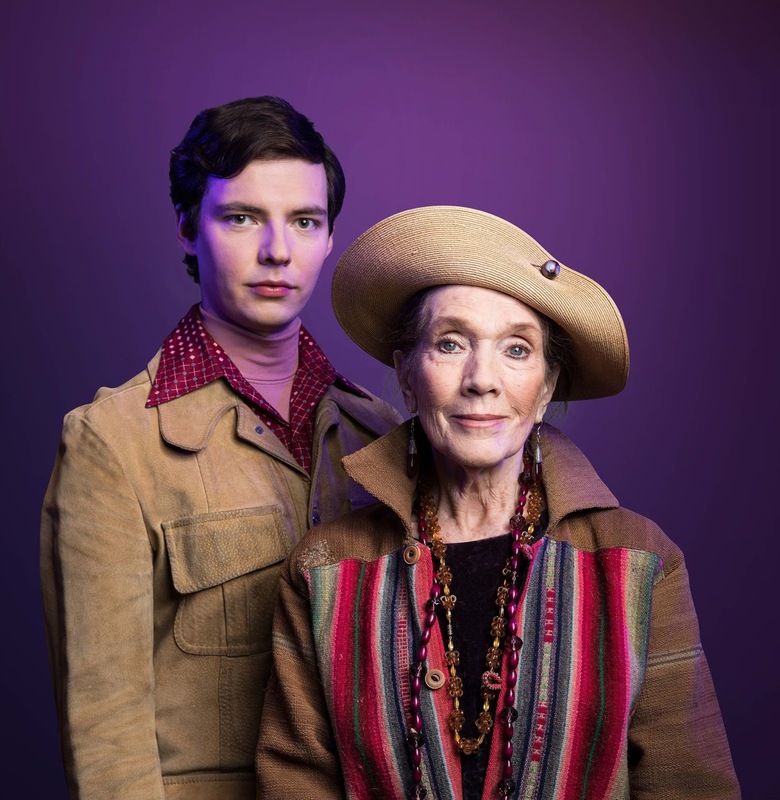 Harold and Maude by Colin Higgins is directed by Thom Southerland, Artistic Director of Charing Cross Theatre. Itb has been nominated fior 5 Off West End Awards - Best Female: Sheila Hancock, Best Male: Bill Milner, Best Costume: Jonathan Lipman, Best Set: Francis O’Connor, Best Lighting: Matt Clutterham. Linda Marlowe worked with Steven Berkoff over a 25-year span as his leading lady in most of his plays, touring internationally and in the West End. Her association with him gave rise to her first solo show, Berkoff’s Women. She followed that with No Fear, Mortal Ladies Possessed, Believe, The World’s Wife, written by Carol Ann Duffy, the poet Laureate, and Miss Havisham’s Expectations. She has toured these shows nationally and internationally and won the What’s On Stage, Peoples Choice Theatre Award as Best Actress in her solo show Berkoff’s Women, seen in the West End at the Ambassadors Theatre. In her many TV and film appearances she has worked with Richard Burton, Peter OToole, Albert Finney, Adrien Brody and Gillian Anderson. She last appeared at Charing Cross Theatre as the star of Tennessee Williams’ In the Bar of a Tokyo Hotel. Patrick Walshe McBride is currently appearing daily on BBC1 as series regular Sebastian in Shakespeare & Hathaway. On stage he played the title role in Peer Gynt (Barbican and BBC Radio 3) and appeared in the West End with Nicole Kidman in Photograph 51 (Noel Coward). Patrick was a finalist for the Michael Bryant Award (National Theatre) and the Carleton Hobbs Award (BBC Radio). Harold and Maude is an idiosyncratic romantic fable told though the eyes of the most unlikely pairing: a compulsive, self-destructive young man and a devil-may-care, septuagenarian bohemian. Dame Marjorie “Maude” Chardin is a free spirit who wears her hair in braids, believes in living each day to its fullest, and “trying something new every day”. Harold Parker Chasen is an 18-year-old man who is obsessed with death, attends funerals of strangers for entertainment and stages elaborate fake suicides. Through meeting Maude at a funeral, he discovers joy in living for the first time. Part dark comedy and romantic innocence, Harold and Maude dissolves the line between darkness and light along with ones that separate people by class, gender and age. Johnson Willis (Dido Queen of Carthage, Salome, RSC). Director Thom Southerland, Designer Francis O’Connor, Costume Designer Jonathan Lipman, Lighting Designer Matt Clutterham, Sound Designer Andrew Johnson, Composer Michael Bruce, Casting Stephen Crockett for David Grindrod Associates. Harold and Maude is produced by Steven M. Levy and Vaughan Williams. Consulting producer James Cass Rogers. Thom is Artistic Director at Charing Cross Theatre. His opening season of major musicals included the European première of Maury Yeston’s Death Takes A Holiday, the return of his acclaimed multi award-winning Titanic and Ragtime (nominated for a record 14 Off West End awards). He is directing the first ever revival of Andrew Lloyd Webber’s The Woman in White at Charing Cross Theatre in December. He was longlisted Best Newcomer in the 2011 Evening Standard Awards for Parade. He was named Best Director at the 2011 The Offies for Me And Juliet at the Finborough. He directed Allegro, Grey Gardens, Grand Hotel, Titanic, Victor/Victoria, Mack & Mabel and Parade (Southwark Playhouse); The Smallest Show on Earth (Mercury Theatre, Colchester & tour); Jerry Herman’s The Grand Tour (Finborough); The Mikado (Charing Cross Theatre); Daisy Pulls It Off, Irving Berlin’s Call Me Madam! (Upstairs At The Gatehouse); the European première of I Sing!, Divorce Me, Darling!, Annie Get Your Gun, The Pajama Game and sold-out all-male adaptations of Gilbert and Sullivan’s HMS Pinafore and The Mikado (Union); Noël and Gertie (Cockpit); the European première of The Unsinkable Molly Brown (Landor); the European première of State Fair (Finborough & transfer to Trafalgar Studios).